The latest Yellow Pages publications are due to be delivered over a 2-3 week period commencing 15/06/17. Ideally the directories are posted through the letter box, handed to the householder, left in a dry, secure out of sight position or left with a neighbour and a card left giving notice of this or offering an alternative delivery date. If there are any problems, DEYA can be contacted on 0800 5420 532, choosing Customer Services. A resident has had a large pot containing pansies stolen from the front of their property. Please consider the value of garden ornaments, etc before placing them at the front of properties. Bike Theft is on the increase throughout North Lincolnshire and although there are no specific hotspots please could everyone be vigilant when leaving their bikes unattended even if only for a couple of minutes. Please ensure bikes are locked using an adequate and proportionately costing lock to the value of the bike. Bikes should be stored overnight and when not in use in secure sheds and garages. Bikes, along with other valuables can also be registered on Immobilise by visiting www.immobolise.com or using a property marking pen with house number and postcode. Humberside Police have asked for the following to be passed on: There have recently been some thefts of farm vehicles and attempt thefts. Can you please ensure you consider security measures to make your items as difficult to steal as possible. Please take appropriate steps, securing vehicles within locked barn or outbuildings where possible, working security lights, advisory signs, perimeter gates with appropriate and proportionate locking devices. As always we encourage any suspicious activity to be reported to Humberside Police on 101 or if a crime is in progress please call 999. Following the recent spate of ‘white van incidents’, it has been noted from facebook that many local people have experienced them to the extent that quite a ‘conversation’ has grown consisting of when and where else these white vans and occupants have been and questions about the issues and how other victims have dealt with them. Would facebook users therefore consider adding their experiences of scams and crimes in the area to facebook and be ready to converse with other facebook users. This may help build up a picture of criminal activity and to a certain extent, forewarn others and maybe act as a deterrent in the long run. 26th June, 20th July, 17 Aug, 26th Oct, 21st Nov and 19 Dec.
Another white van was seen in the Parish at 0730 hrs on the morning of 11 May with the occupant of the vehicle taking pictures. The registration was NV 17 JVT. The occupant said he was from Morrisons working with the electrical company. He showed what was felt to be a bad home-made letter of identification. This has been reported to the police: Log 73 of 11/05. Update to this report 15.5.17 - Please note that the recent report regarding a suspicious white van which has been issued Police Log 73 of 11/05 has been investigated by the Police and has been deemed legitimate, the driver being a genuine contractor. The Police continue to encourage that all reports to them be made via the 101 number or 999 if it is an emergency or it is felt that a crime is actually being committed. Also, a resident found a man roaming all around their garden on 11 May at 0800 hrs taking photos. He said he was checking the height of a pole, (electrical). It was pointed out to him that the pole was at the front of the property! This has been reported to the police too. 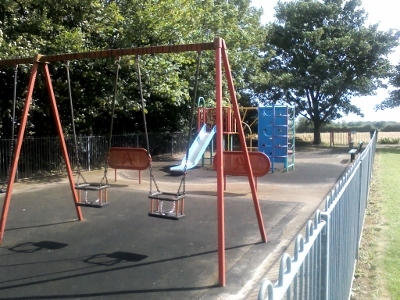 Alkborough Parish Council has been advised by the local Conservative Team - Andrew Percy MP and the Burton & Winterton Ward Councillors - that funding for improvements to Alkborough and other play areas within the ward is available from North Lincolnshire Council. The Parish Council would need to make a formal application for funding, and would like to invite suggestions, ideas and comments from the community. Things such as the age groups that should be catered for, the types of equipment that could be considered, why children maybe don't use the current play area, its location or other reasons, and anything else you would like to comment on. Please send your feedback to enquiries@alkboroughwalcotparishcouncil.gov.uk or via our contact us page. Posted 27.4.17 It has been reported that a white highway maintenance truck has been cruising around Walcot with the occupants, male and female, peering into drives, looks like they are videoing. Registration KX66UTV. The police have been advised and have responded that no offences have been reported but for residents to be vigilant. Please report anything suspicious using the '101' telephone number. It has been reported that a white transit van has been driven, uninvited, up someone’s drive. The man driving claimed to be a landscape gardener and tree clearance expert and offered a piece of yellow paper to this effect which also stated ‘CDS Tree & Landscape Services – call Ben on 07776318349’. When this number was rung, there was no answer. There was also a young boy in the van. Only part of the reg number was noted and thought to be: YY 04 … The van was driven away when requested to do so – may be genuine but best to be aware! The second Safer Neighbourhoods Surgery in Alkborough will be on Thursday, 11 May in the Coronation Club between 1730 – 1900 hrs and gives the chance for residents to air their views on any concerns re crime, anti-social behaviour, speeding, police presence, etc, directly to a Safer Neighbourhoods officer. There was no public attendance at the first surgery in April – should there be no attendance at this second one, consideration will be given as to whether to hold any further surgeries in Alkborough. A Safer Neighbourhoods Officer from the North Lincolnshire Councils’ Safer Neighbourhoods Team will be present in the Coronation Club on Thursday 6 April from 5.30 pm to 7 pm and Thursday 11 May, again, from 5.30 pm to 7 pm. The North Lincolnshire Safer Neighbourhoods Partnership, (NLSNP), is a partnership between the emergency services, councils and public, private and voluntary sector agencies, working together to reduce crime, disorder and substance misuse. Its remit includes trying to improve how existing services are delivered and working together with residents and voluntary groups on specific neighbourhood problems. This is a new initiative and will give the community the opportunity to voice any concerns it may have about crime, scams, anti-social behaviour, police presence, etc in the neighbourhood, directly to a member of the team. The Parish Council is inviting applications for the position of Parish Clerk to commence mid May. Please click here to see full job advertisement. The National Plant Monitoring Scheme is helping us to understand what is happening to different habitats across the UK and is set to run for a number of years. The scheme has been running for two survey seasons and over 900 volunteers have signed up and been out surveying. Many volunteers are new to plant surveying and have found the scheme accessible, and are enjoying taking part and are exploring places close to them and finding out new things. Volunteers are supported by materials which are sent to them, online resources and free training courses. Volunteers are recruited and supported to survey 5 plots in a kilometer square close to where they live. Across North Lincolnshire there are still 45 squares available to survey. So if you enjoy being outside are interested in this scheme please click here for more information. The Plunkett Foundation is a national charity that helps communities across the UK to set up and run community co-operatives; enterprises that are owned and run democratically by large numbers of people in their community. Community co-operatives help people to tackle a wide range of issues, from social isolation and loneliness to poverty, and come in many different forms including community shops, pubs, cafes, woodlands, food and farming enterprises and anything in between. Since 1919, Plunkett has supported over 500 such enterprises to set up by providing help, advice, and when funding allows, financial support. For more information please click on this link. The Julian's Bower trustees are looking for suggestions for fund-raising ideas. Please click here for poster. Following the success of the Parish Paths Partnership scheme in the 2016 season, the Parish Council has decided to continue in this scheme for 2017. Funding is provided by North Lincolnshire Council for the maintenance - grass cutting and strimming - of public rights of way footpaths, bridleways and permissive paths. The Parish Council can also consider other work under the Parish Paths Partnership scheme to improve these rights of way. If you have any other issues with any of these paths please contact the clerk. Click here to see a map showing the public rights of way footpaths (in purple) and bridleways (in green). Click for Permissive Path 1, Permissive Path 2 & Permissive Path 3. The HealthWalk Co Ordinator from North Lincolnshire Council has sent us the Walk Programme for January to April 2017. Please click here for all the details. Street Sports sessions were made possible due to a joint collaboration between Alkborough, West Halton & Whitton Parishes, however due to a drop off in numbers attending the Street Sports session the Parish Council has decided to shelve this provision at the moment. If sufficient demand existed, and a future collaboration was possible, then this could be re-considered in the summer months next year. If you would like to see future Street Sports please let the Parish Council know by contacting the Clerk. Unfortunately at the moment we are awaiting delivery of replacement equipment for upkeep of the grass cutting at the cemetery. During this time only limited grass cutting is possible. North Lincolnshire Council is taking action to increase the number of publically available AEDs in communities in North Lincolnshire setting aside funding for this purpose. Alkborough Parish Council were contacted to see if it could facilitate the installation of an AED in Alkborough parish. After some investigation and consultation into possible locations, the Parish Council were very pleased to hear that Alkborough Coronation Club would be prepared to have a device sited on its building. We are pleased to inform that this has now been done, and the AED can be found on the club wall on Cross Lane, Alkborough. North Lincolnshire Council own and are responsible for the AED. The AED is extremely easy to use and will take you through the process, from the time you lift the lid. Humberside Fire & Rescue Service Firefighters from the Retained Station at Winterton will be giving a demonstration of Heartstart Training (Cardiopulmonary Resuscitation/CPR) and use of the Defibrillator at the Methodist Chapel on Front Street on Wednesday 26th October. The session will start at 18:30 and will last approximately 2 hours. Please make their attendance worthwhile and come along yourselves to discover how to use the defibrillators and give CPR. The session is free. North Lincolnshire Council has sent us an update on the new Call Connect transport service. To find out all about this and how to use it please click here. North Lincolnshire Council have advised of a Gliding Event being organised in conjunction with Blue Door and Safer Neighbourhoods. This is taking place on the 19th August 2016. Please see flyer for more information. Update 18.8.16: event cancelled due to bad weather forecast. 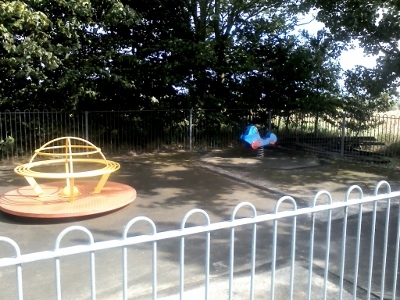 The Parish Council has been able to pay for essential works to the Play Area surface prior to its annual inspection. Several Councillors kindly gave their time to remove the timber partitioning from between the rubber surface and tarmac areas, which was necessary due to the timber becoming unstable. Work was then carried out by North Lincolnshire Council to replace the timber with a strip of new tarmac edging up to the rubber areas. Since these works a volunteer has swept all the surface, cleaned all play area equipment to remove algae and removed the build up of moss from areas around equipment. 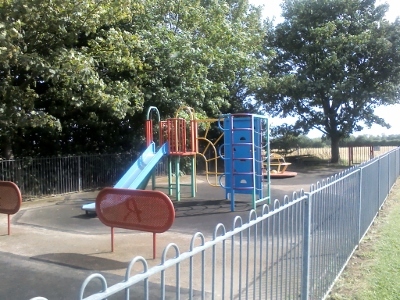 The Play Area looks very good now as these photographs show. 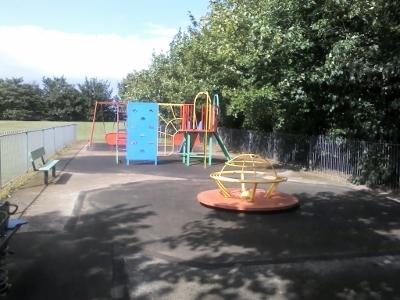 The Parish Council is also continually very grateful to the several volunteers who give their time to inspect the Play Area on a weekly basis and report to the volunteer Play Area Co-Ordinator. North Lincolnshire Council are inviting nominations for the 2016 Community Champion Awards. Nominations close on Sunday 18th September. Please click here for the flyer giving information about the awards and ways in which you can nominate individuals. The awards ceremony will take place at The Baths Hall on Thursday 24th November 2016. 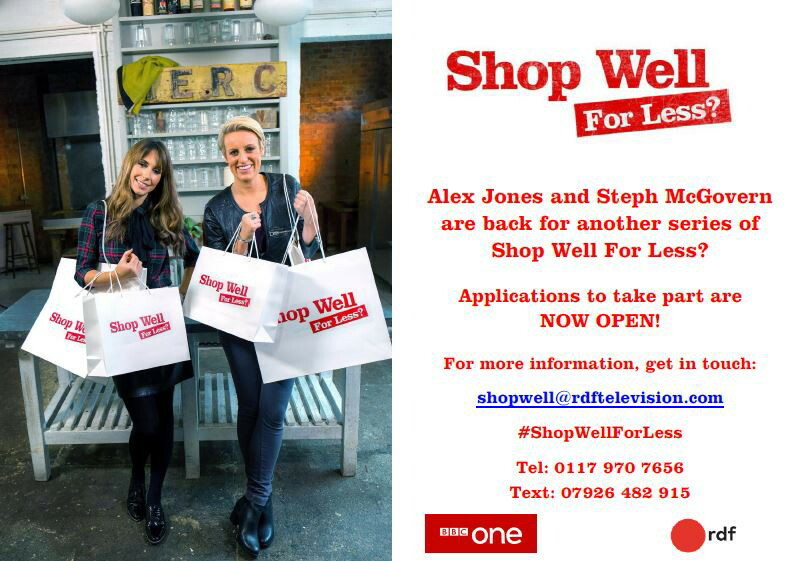 BBC ONE TV SERIES - SHOP WELL FOR LESS - IS BACK! We’re looking for families who love to shop and would like to take part in the new series. We all love to shop. But can we rein in the spending and still keep the lifestyle we want? If you love to shop and would like to take part in the programme – get in touch! The Parish Council joined the Parish Paths Partnership scheme at the beginning of this grass cutting season. This is an agreement with North Lincolnshire Council whereby Parish Councils take control of the maintenance of footpaths, bridleways and permissive paths within their parishes. The Parish Council then applies to NLC for the funding required to carry out this maintenance. The Parish Council has appointed a contractor for this season and agreed to cut all paths five times this year. The first cut has been completed and the second cut is almost complete. The Parish Council has appointed a new person for cutting the grass at the Church grounds and Low Wells. This started just in time for the improvement in the weather and the start of the grass growing season. Both areas are looking very good. The Parish Council is in the process of purchasing a new strimmer for the areas that cannot be covered by the mower. Curlys Athletes will be holding an exciting spectacle for the villages in our area. On 22nd May 2016 a Duathlon (run/bike/run) will start at Normanby Park 09:00 with a 10k run and then a 40k cycle on the roads through the villages of Normanby, Flixborough, Burton, Thealby, Coleby, West Halton, Alkborough and Walcot, followed by a further 5k run back in the grounds of Normanby Park. The race should come through Alkborough & Walcot from around 10:00 and on-going individual cyclists coming through until around 11:30. Alkborough & Walcot Parish Council are happy to see this event coming through our parish. For more information see flyer. To see how you can support this click here. Following the very successful first Street Sports Event on 30th March 2016, Alkborough and Walcot Parish Council, in conjunction with West Halton & Coleby Parish Council and Whitton Parish Meeting, have arranged a second Street Sports Event for the Whit Week School Holidays on Wednesday 1st June 2016. This is taking place in West Halton Village Hall. Street Sports Events are run by North Lincolnshire Council Sports, Leisure and Culture. This event is free and for 8 to 18 year olds. For more information see the flyer. Update: The 2nd Street Sports event had fewer in attendance however this may have been due to the fact that people were on holiday. It was still enjoyed by those who attended. Investigations are currently underway to see if it would be possible to offer further Street Sports provision. Queen Elizabeth is 90 on April 21st and celebrations will be held across the country to mark the occasion. The Parish Council will be lighting their beacon as part of a nationwide event - 'The Queen's 90th Birthday Beacons' to be held on 21st April 2016. This event is to help unite the nation in common celebration of this important milestone in The Queen's life. The beacon will be situated adjacent to Julian's Bower on the hilltop off Back Street, Alkborough. The Parish Council are also currently investigating funding options through North Lincolnshire Council to add to this celebration. More information will be posted when it becomes available. Update This event was very successful and received a good attendance. The beacon lighting took place at 8.30pm due to a time change by the national organisers. This gave a good opportunity for some socialising in Alkborough Club until the lighting. Michelle, the Steward did a really good job in providing the food which was themed with sandwiches and union jack decorated cupcakes. Union Jack bunting added to the occasion. The weather was kind on the evening and a beautiful sunset made a fitting backdrop to the lighting of the beacon. 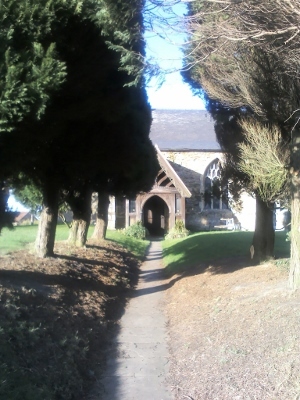 A De Minimus order has been granted by the Diocese of Lincoln to allow pruning of the trees that line the church path. These trees are overhanging and causing obstruction in addition to cutting out light to the path. This was granted provided that no Tree Preservation Order existed. After checking with the planning department at North Lincolnshire Council it was established that no Tree Preservation Order existed. However, as these trees are within the Conservation Area, the Parish Council had to apply for permission to carry out these works. This permission was granted, The trees have now been pruned and the path access greatly improved.